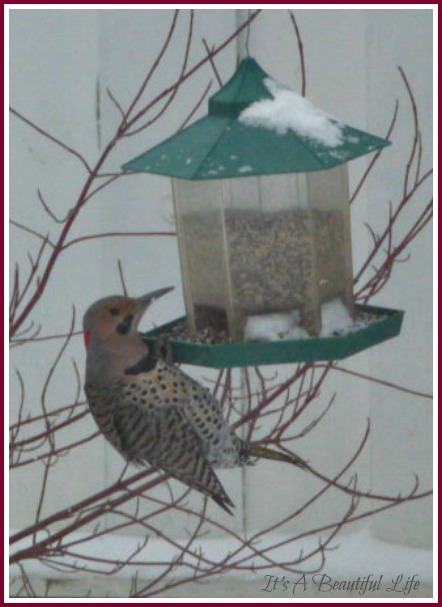 In my posting from the other day, I mentioned seeing the Northern Flicker hanging up-side-down onone of our small bird feeders. The thing is, I didn't have the camera nearby to catch him. Fortunately yesterday, when I heard the now familiar whistle and my glance out the window confirmed he was indeed out there, I was ready for him. Hanging by a toenail, happily poking out his share of the seeds, he seemed mindless of any shadow or movement my camera and I might have made. No hanging upsidedown today, but we were delighted to catch his pose. And, we love that he considers our yard a regular stopover now! I'm not a robot but starting to feel like one...lol! How wonderful that you got a second chance to get your flicker. What a great shot. Sometimes I know just how he feels, hanging on with my toenails. What a pretty fellow! I don't believe I've ever seen one before. If you don't mind my asking, what state do you live in? I'm curious about the habitat. Blogging Tip: Did Your Blog Go Missing?